When matchmaker Kennedy Pepperdine gets trapped in an elevator with a handsome stranger, she confesses to him that her current boyfriend might not be as perfectly matched to her as she thought. Imagine her surprise, then, when that same handsome stranger turns out to be her current boyfriend’s older brother...and she’s stuck with him for the next week, visiting her boyfriend’s family for Christmas. The more time they spend together, the more they each start to wonder if Kennedy’s supposed “right match” just might be the wrong brother. Each book in the Anyone But You series is a standalone, full-length story that can be enjoyed out of order. Yes, she still loved Justin, but every time she was in a room with Matt, it was all she could do not to get caught up in the magnetism of attraction that was building between them. Kennedy + Matt + A bottle of champagne + A stuck elevator = A kiss that neither one of them will ever forget. What happens in Vegas, stays in Vegas. Right?! Super cute holiday read. Another fun addition to the series. Wrong Brother, Right Match was a sweet holiday romance, that was just the thing I needed at the time! 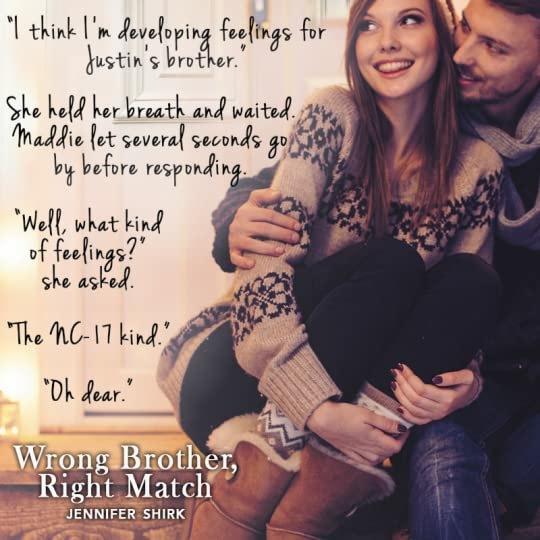 Wrong Brother, Right Match was a sweet, fun and entertaining read. I found Kennedy and Matt were both great characters, they were likable, relatable, they made me laugh, swoon and I enjoyed watching them connect and fall in love. Happy to announce Wrong Brother, Right Match, WON the Sweet Traditional category of the 2017 Golden Quill Published Authors' Contest! Hi. Yes, this again is MY book, so naturally it's a five star rating from me. Anyway, I've always wanted to write a Christmas book. This a cute contemporary romance. The characters are fun and the pacing is great. I enjoyed reading this book. This romance novel was a pushing to the edge of the envelope with out going over PG 13 version of the typical G rated Christmas Holiday Hallmark movie. Not for minor age. See substance use, language, and sensuality content below. Oh, yes! I only wish I could have read it closer to Christmas. Definitely gets you in the mood for the holidays! Sweet, funny, and charming. Kennedy is a hoot. Was given this ARC in exchange for an honest review. Copyright © 2016 by Jennifer Shirk. All rights reserved, including the right to reproduce, distribute, or transmit in any form or by any means. For information regarding subsidiary rights, please contact the Publisher. Kennedy Pepperdine’s life could not be more perfect. Well, technically it could be, she supposed. That half-baked rival matchmaking firm that opened up six months ago could go belly-up, and then her life really would be set. But for right now, her business, Match Made Easy, was holding its own, she’d just delivered a successful presentation on her new matchmaking software, and—best of all—she was in love. Thoughts drifting to her perfect boyfriend, Kennedy pulled out her cell phone as she made her way through the Chairman’s Lounge of the Bellagio hotel. Since arriving in Vegas for the Creative Technology Developer Conference four days ago, she and Justin had only had time to exchange voicemail messages. Justin worked at the Briarwood Investments firm in Boston, and he had been adamant about it being the worst possible time to leave and that his workload simply would not allow it. Although disappointed, she couldn’t fault him for wanting to get ahead in his firm. She felt the same way about her own business. They were both workaholics, they both wanted 2.5 kids and a dog, and they shared the same Game of Thrones TV-watching obsession—which was why they were so perfect for each other. Her matchmaking software was obviously a success. She’d tested it on herself early in its initial phase, which was how she met Justin in the first place. It was just the break she needed for her company. The numbers proved Match Made Easy was taking a hit from the competition, so she’d needed to come up with something fast before her business was in real danger. However, now she needed to get back to her hotel room. Her feet throbbed, and her mouth was dry from speaking. All she wanted to do was share her day with Justin and take a long, hot bath. But as soon as she tapped his name on her cell phone, it rang once and went right to voicemail. Again. She gritted her teeth. At this rate, she considered herself going steady with that stupid automated message. “Hi, sweetie, it’s me—Kennedy. Again.” She winced at herself for adding the “again” part. She never wanted to be one of those petulant girlfriend types. “Um, I just finished my presentation and everything went great. Just wanted you to know my flight leaves early tomorrow morning. Can’t wait to see you.” And finally speak to you. “Hope everything is good. Miss you.” She clicked her phone off and tossed it in her purse. Wouldn’t he have tried to call her in the middle of the night? Wouldn’t he have needed to hear her voice at least once during her trip? Maybe even when he first woke up in the morning before he got out of bed and started his day? No. No way. She refused to let any more doubt cloud her opinion of him or their relationship. He was handsome and driven and everything she was looking for in a man. So what if he couldn’t find the time to call her? She picked up her pace to the elevator and counted herself lucky—dang lucky—for even finding such a focused, hardworking boyfriend. The man was a complete prince and always there for her when she truly needed him. She glanced around the spacious entryway. The elevators were off to the left. She hated elevators—actually, she hated small spaces in general. Much like airplanes, they were a necessary evil in life, so she dashed in that direction. She was already contemplating her exact room service order when she saw the up elevator doors open, but then they almost immediately began to close again. Oh, no! “Hold the elevator, please!” She pressed her briefcase to her chest as her heels pounded the marble flooring as fast as her tippy toes would allow. Just when she thought she’d missed her chance and would be stuck waiting, a large hand shot out, keeping the doors from closing. Thank goodness. The elevators were beyond slow because of the huge conference crowd. Huffing and puffing—she really should visit her cousin’s gym more—she stumbled into the elevator with dizzying relief. She caught her breath and finally looked up into the eyes of her saving grace, only to have her lungs deflate all over again. Oh, dear heaven above. She actually melted a little, grateful the wall of the elevator kept her somewhat upright. Elevator Guy was ridiculously gorgeous. So gorgeous that despite the jeans, sensible blue collared shirt, and blazer ensemble he was sporting, she still had to wonder if he was a headliner at the Chippendales show next door. He had sandy brown hair that was in need of a good trim and just a teensy bit of facial hair that was somewhere between a five o’clock shadow and a short beard. All that combined with the intensely serious expression on his face made him seem just a little bit dangerous. But dangerous in a good way. That is, if she were into handsome, dangerous men and wasn’t already in a fantastic relationship with a handsome man of her own. The hunk suddenly shifted away and sent her a hesitant smile. That’s when she realized she was gawking. Great, he didn’t even know her, and she was already labeled a stalker. She could only hope drool wasn’t glistening off her chin. He simply raised a brown eyebrow. Oh. Right. He was going to press the button for her. Duh. Heat rushed to her cheeks. “Twenty-four, please.” Snap out of it, Kennedy. He pressed her floor number for her and—just out of curiosity, mind you—she noticed he was going to one floor above hers. Or most likely to his girlfriend’s floor. A giant bottle of champagne was secured under his arm and two champagne flutes dangled from his left hand. He was probably heading up there now to surprise her. She would have given anything to have Justin surprise her like that. He rarely did anything spontaneous. She was about to berate herself for thinking such negative thoughts when the lights flickered a few times then went out completely. The elevator came to an abrupt stop, and she braced her hand on the wall to keep from losing her balance. “Oh my gosh, what’s happening?” she choked out. Her pulse skyrocketed. Immediate thoughts went to the chance there was a broken elevator cable or a possible fire. Or a terrorist plot! Unfortunately, being an avid movie watcher, she knew a little too well all the countless tragedies associated with elevators. Her briefcase fell to the floor with a thud, and she held her head in both hands, trying to take deep, slow breaths. The air already seemed thin. Ohmygosh, she was going to die. She was going to suffocate if she didn’t drop to her death first. She never had a chance to say good-bye to her family, her friends. To Justin. She had to escape. Hands poised and ready to begin clawing her way out, she suddenly noticed Elevator Guy turn on the flashlight app on his cell phone and press the emergency button. Using the light to guide him, he flipped a small metal latch beneath the floor buttons and pulled out a hidden phone, as if getting stuck in an elevator was an everyday occurrence for him. Oh, no. Maybe he’s the terrorist! She felt even woozier. Hey! Now, what is that supposed to mean? She planted her fists on her hips and bore a hole right through the side of his head with her glare. This guy wasn’t nearly as handsome as she’d originally thought. Not at all. He was only marginallyhandsome at best. “Apparently so.” Elevator Guy sank down on the floor, making himself comfortable. This is so not happening. No, no, no. She shook her head. This would not do. She was not going to just sit here and wait as he used up all her oxygen. The walls felt like they were closing in like a trash compactor. She wiped her perspiring forehead. Surely somebody could pull some strings and get things moving quicker. She whipped out her cell phone and tried to call Justin again. He would know what to do. He was smart and reliable and—unlike her companion here— compassionate. She held the phone to her ear, tapping her toe as she waited. Pick up the phone this time. Pick up the phone. His voicemail message—the one she could recite by heart—began to play. She swore under her breath. She wanted to laugh. The man looked anything but tense. She, on the other hand, was a tightly wound mess. She was already having trouble catching her breath. Stress-induced asthma. That’s what her doctor had labeled it the first time she experienced it. Probably just a fancy diagnosis that meant: does not deal well with unexpected problems. He advised her to get enough sleep (she was working on that), do yoga regularly (totally would do once she found the time and the flexibility), and carry a paper bag with her at all times (done). Since a nap and downward-facing dog were obviously not going to happen, she pulled out a folded brown bag from her purse and began to slowly inhale and exhale into it. “Yes,” she mumbled into the bag. “I need to get out.” It was a control thing. Her mind knew that. It really did—even if her body and lungs did not. “Okay, okay, relax,” he told her, holding up splayed hands. Ha! Easy for him to say. Sitting there like a cabana boy as if all he needed in the world was a pair of Oakleys and some sun-tanning oil. She took deeper breaths in and out. “I can’t relax.” The bag collapsed in. “I want out.” The bag expanded out again. She paused. Looked at him closely. “You promise?” she said into the bag. “Okay.” She nodded, and her shoulders relaxed just a smidgeon. There was something about the confidence in his “I do” that had her believing him, and it soothed her fraying nerves. The man pinched the bridge of his nose and sighed. “Okay, scratch that. Now I’m thinking I could use a drink.” Shaking his head, he began removing the foiled top. “The number six?” Curious and a little bit thirsty, she sank down on the floor beside him. “I wasn’t.” She smiled at him. He held out his glass, and they clinked. She tentatively took a sip and found it delicious. Elevator Guy definitely knew his wines. Kennedy didn’t have a hard time believing that. The man looked like the type to be pretty popular with the ladies without even trying. They both drained their glasses fairly quickly. “Might as well put this to good use,” he said, picking up the bottle and topping them both off. “And I hate to even point this out, but you already stopped needing that thing.” He motioned to her lap. “Are you describing me or the wine?” He grinned. She smothered a smile, clinking her glass with his, and drank. Perhaps she’d misjudged Elevator Guy earlier. He seemed sensitive to her plight. He’d also managed to divert her attention from the situation and even make her feel more relaxed. Plus, he wasn’t so hard to look at, either.